The NVIDIA Driver is a software necessary for your NVIDIA Graphics GPU to function with better performance. It exchanges information between your Linux operating system, in this case Fedora 28 Linux, and the hardware in question, in this case the NVIDIA Graphics GPU. In this guide you will learn how to install NVIDIA Drivers on Fedora 28 Linux. First, we will be disabling the default nouveau opensource NVIDIA Drivers and then install the official NVIDIA Driver by using the Linux terminal command. How to identify your NVIDIA graphic card model. Where to download the NVIDIA driver package for Fedora 28. How to install prerequisites for a successful Nvidia Driver compilation and installation. How to disable nouveau Driver on Fedora 28. How to successfully install NVIDIA Drivers on the Fedora 28 operating system. 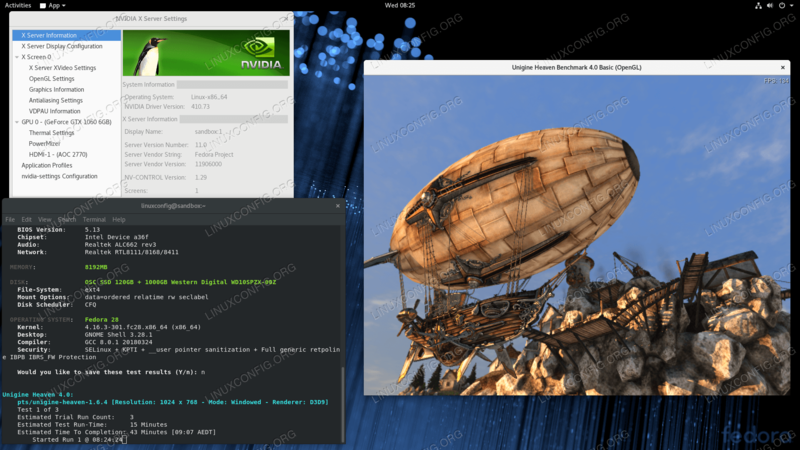 Installed Nvidia drivers on Fedora 28 Linux GNOME desktop running graphic card benchmark. Software Existing Desktop installation such as GNOME, KDE etc. Download the Nvidia driver package from nvidia.com using search criteria based on your Nvidia card model and your Linux operating system. Install all prerequisites for a successful Nvidia driver compilation and installation. $ sudo dnf groupinstall "Development Tools"
$ sudo dnf install dkms "kernel-devel-uname-r == $(uname -r)"
The dkms package is optional. However, this package will ensure continuous Nvidia kernel module compilation and installation in the event of a new kernel update. The above line 6 ensures that the nouveau driver is disabled the next time you boot your Fedora 28 Linux system. Once ready execute the following command to apply the new GRUB configuration change. Reboot your Fedora 28 Linux System. When prompted answer YES to installation of NVIDIA's 32-bit compatibility libraries, overwrite existing libglvnd files and automatic update of your X configuration file. Reboot your system one more time. All done. The Nvidia driver should now be installed on your Fedora 28 Linux system. Reboot your system now, login and run nvidia-settings to further configure your Nvidia graphic card settings.